This article is about the film executive. For the American college football quarterback, see Joe Roth (American football). Joseph E. "Joe" Roth (born 1948) is an American film executive, producer and director. He co-founded Morgan Creek Productions in 1988 and was chairman of 20th Century Fox (1989–93), Caravan Pictures (1993–94), and Walt Disney Studios (1994–2000) before founding Revolution Studios in 2000, then Roth Films. Roth was born in New York City, the son of Lawrence Roth, a foreman at a plastics plant, and Frances Roth. Roth is of Jewish heritage. In 1959, Roth's father volunteered his son to be a plaintiff in the ACLU's effort to abolish mandatory prayer in public schools. The case, filed in New York, wound its way through the system, finally reaching the U.S. Supreme Court in 1962. The Court ruled that such prayer was unconstitutional under the First Amendment, in the landmark case of Engel v. Vitale. Roth attended Boston University, graduating in 1970 with a bachelor's degree in communication. Over the course of his career, he has produced over 40 films, and has directed six to date, including 1990's Coupe de Ville, 2001's America's Sweethearts and 2006's Freedomland. Roth, who was ranked 6th in Premiere Magazine's 2003 Hollywood Power List, produced the 76th annual Academy Awards. Roth announced that in October 2007, when Revolution's distribution deal with Sony Pictures ends, Revolution Studios will close and he will join Sony as a producer. 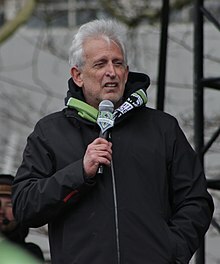 On November 13, 2007, Roth was introduced as the majority owner of a Seattle, Washington–based Major League Soccer franchise along with Paul Allen. Seattle Sounders FC—which calls CenturyLink Field home—began regular season play in 2009. On November 12, 2015, Roth passed on majority ownership to Adrian Hanauer. He was married to Donna Arkoff whose father was movie producer Samuel Z. Arkoff. They have three children. They resided in a mansion designed by architect Douglas Honnold for Irish production designer Cedric Gibbons and Mexican actress Dolores Del Rio in 1929 in Los Angeles, California. ^ a b "B.U. Bridge". October 27, 2003. ^ Hammer, Joshua. "The Sly Dog at Fox". Newsweek, May 25, 1992. ^ Brown, Patricia Leigh (February 29, 2008). "A Moderne Masterpiece Revived". Architectural Digest. Retrieved January 14, 2017.